Can we predict when an invasive species will change an ecosystem’s food web? Why do some aquatic systems change when invasive species arrive while others do not? Will invasives affect how contaminants are transferred up the food web? Water resource managers worldwide are faced with these and similar questions when invasive species are found in local ecosystems. U.S. Geological Survey (USGS) scientists have developed a scientific tool to help assess the potential impacts of invasive species on phytoplankton, the base of the food web in estuaries. 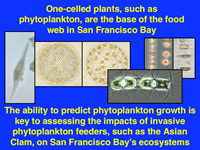 The tool was developed during a study of the impact of an invasive Asian clam on San Francisco Bay, California. Invasive species can affect how contaminants are biomagnified within a food web. The invasive Asian clam, Corbula amurensis, is such an example. The Asian clam is a very efficient bioaccumulator of selenium when compared to other food sources, such as zooplankton. clams and zooplankton form the base of two different food webs in the San Francisco Bay, California. For the food web with the clam at the base, animals at the top that feed mostly on clams have concentrations of selenium great enough to cause malformations of embryo and young and reproductive failure in adults. Animals that feed mostly within the zooplankton food web do not have concentrations of selenium high enough to cause toxicity. So scientists have conjectured that before the invasion of the Asian clam in San Francisco Bay, selenium was most likely not biomagnified up the food web to levels that cause toxic effects. Stewart, A.R., Luoma, S.N., Schlekat, C.E., Doblin, M.A., and Hieb, K.A., 2004, Food web pathway determines how selenium affects aquatic ecosystems--A San Francisco Bay case study: Environmental Science and Technology, v. 38, no. 17, p. 4519-4526. 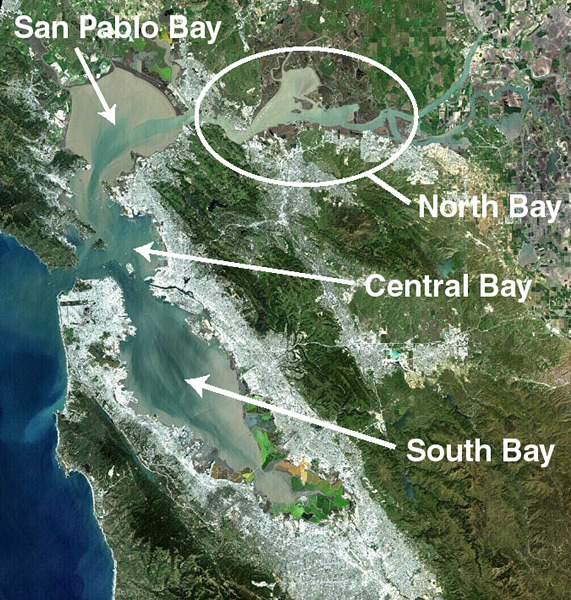 When the invasive Asian clam, Corbula amurensis, (previously known as Potamocorbula amurensis) invaded the northern embayment of San Francisco Bay (see map below), USGS scientists observed that the life sustaining seasonal phytoplankton blooms that occurred before the invasion of the Asian clam stopped. Why? When compared to the resident clams that the Asian clam replaced, the Asian clam is a voracious phytoplankton feeder that can filter much larger quantities of phytoplankton from the Bay’s water, and they are capable of living in more extreme conditions than the resident clams could. The end result is that the Asian clam eats enough phytoplankton to prevent the annual summer and fall phytoplankton blooms in the northern embayment, which has had a major impact on the food web in the embayment. Some species that relied on the abundant phytoplankton during the summer and fall blooms have been impacted. 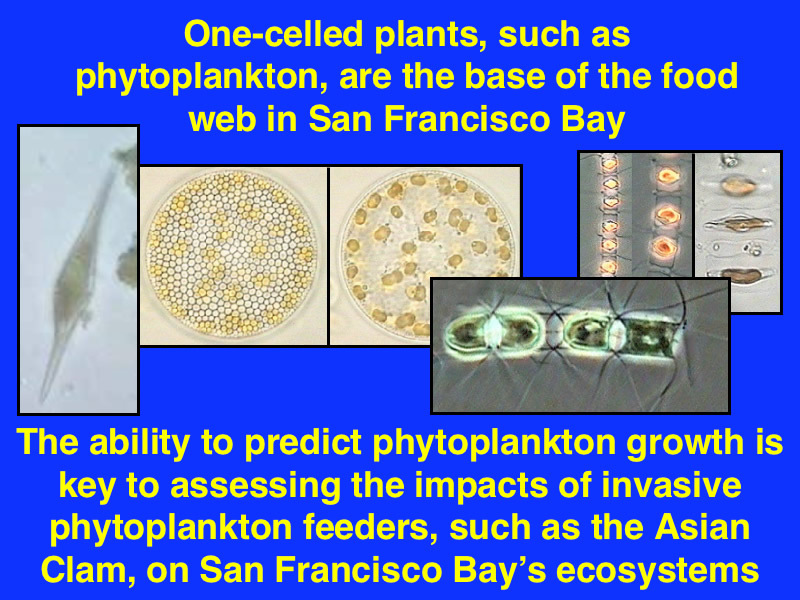 The phytoplankton blooms in San Francisco Bay are not associated with runaway growth because the bay is light limited (less light means less phytoplankton growth). Chesapeake Bay is not light limited and is an example of the negative side of phytoplankton blooms, which can lead to a decrease in dissolved oxygen in the water in some cases. The invasion of the clam in the southern embayment did not occur for two more years and when it did occur, there were no discernible effects on the phytoplankton. Why? The scientists have determined that the two primary factors controlling the differences in these two ecosystems are the relative timing of the annual phytoplankton bloom, which is regulated by physical factors in both bays, and the annual predation of clams in shallow water by migratory birds. Unlike the northern embayment, the phytoplankton bloom in the southern embayment occurs only in the spring during a period of clear water that allows enough light for the phytoplankton to grow. Spring is also a time when the Asian clams have not recovered from being eaten during the annual winter migration of ducks and shorebirds into the San Francisco Bay area. So a combination of lower number of clams and the phytoplankton bloom occurring in spring results in the invasion having no effect on phytoplankton blooms in the southern embayment. San Francisco Bay, California, consists of several subembayments. North Bay consists of Honker, Suisun, and Grizzly Bays. Based on this experience, USGS scientists have developed a tool that can be used to predict the impact invasive filter feeders, such as clams, might have on an estuary's food web. Whether or not clams or other filter feeders will have a major impact on the amount of available phytoplankton depends on factors such as how much water the clams can filter, how much water moves past the clams, and how well the water is mixed. Scientists often represent these complex factors as variables in the tools they use to study ecosystem response. USGS scientists have discovered that measuring the average depth of water divided by the range of tides in an estuary is a more accessible predictor of phytoplankton fate under a wider range of conditions than other commonly used variables, such as the harder to derive residence time of water (how long it takes a volume of water to leave the water body). The ability to predict the fate of phytoplankton is key to understanding the fate of organisms that are higher up in the food web. This new tool can help water resource managers make scientifically defensible decisions regarding responses to invasive species in estuarine environments. Microscopic views of typical phytoplankton. Thompson, J.K., 2005, One estuary, one invasion, two responses--Phytoplankton and benthic community dynamics determine the effect of an estuarine invasive suspension-feeder, in Dame, R.F., and Olenin, S., eds., The comparative roles of suspension-feeders in ecosystems: the Netherlands, Springer Press, p. 291-316.